Today is Secret Recipe Club reveal day for Group C! I hope everyone had a great V-Day! I was assigned the super sweet blogger Annie at Annie’s Noms. And, when I say “super sweet,” I really mean it. Annie has posted some delicious decadent, sugary sweets and it was hard to not pick one. As I was knee deep in lemons when I received the assignment from Debbi, it was hard not to pick Doubly Lemon Cupcakes or Lemon Short Bread. We are trying to do better at EE and cut some of the sweet stuff out, so I searched through Annie’s blog for a healthy dish. 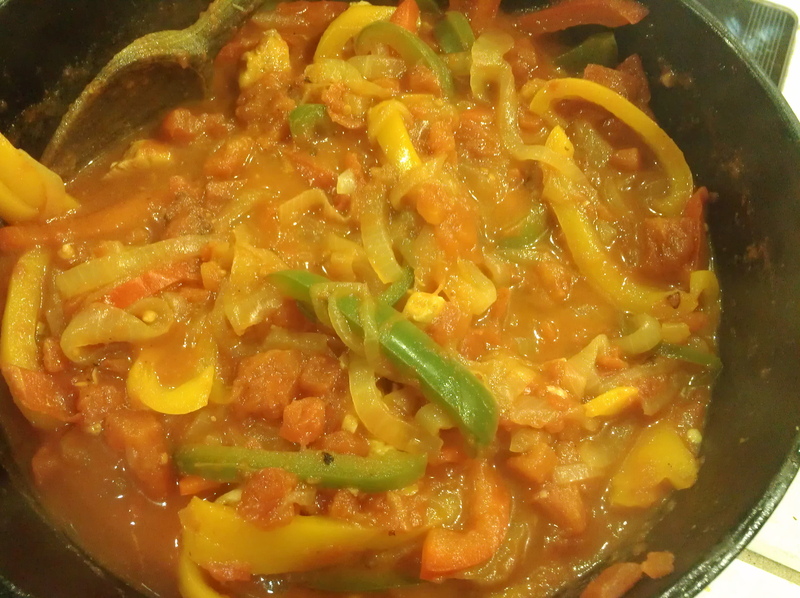 I found a great one for Peperonata with Chicken. I thought it sounded delicious and it included simple and fresh flavors. I couldn’t help myself and added some pasta. Heat olive oil in a large skillet. Add chicken and lightly brown. Add onions, garlic and bell peppers. Cook on medium heat for about 12 minutes, stirring often. Onions should be browned a bit and peppers should be soft. Add tomatoes, sugar and salt and pepper. Simmer for about 20 minutes. Add basil and toss with pasta. Serve. This was really delicious and proved to me that you can make a great pasta dish without cheese. Shocking, isn’t it? Do you remember the Versatile Blogger Awards that were making the rounds a couple of years ago. I loved the “7 Crazy Things” part of that award. I think we all should post crazy things about us yearly so we can revisit what makes us unique and maybe, more importantly, simply remember to be spontaneous and carefree. Here is Annie’s craziness and I think it tells a lot about her. I definitely share the cookbook addiction, Annie. I think I may have over eighty as well. A huge thanks for the great dinner idea, too. This looks like a comforting pasta dish that I would totally love too! It is comforting. Thanks, Angie. I read your comment early this morning, but I couldn’t get to your site at work. blogspot.com is blocked. 🙁 I am so glad you got me for SRC. It looks like you have the same waffle iron. 🙂 I am so impressed you made your own sausage. It was (and still is) yummy. This made a huge batch. This is a pasta I could sink my fork into! So delish – Nice choice for SRC! It is hearty. Thanks, Chris. This is one of those keeper recipes for family dinners – yum! I think we will make this a keeper. I love the 7 things…what a cute idea. This dish would be great for leftover chicken also, the pasta addition was perfect! Like I said, I think we all need to think of at least 7 crazy things sometimes. What a super recipe to make during the work week – tasty, quick and good for you! Nice SRC pick! Good and tasty and pretty easy to whip up. I like all those ingredients. Oh, now my tummy is rumbling. I had a small lunch and now, so ready for a quick dinner. Can I come over?! No cheese????? ok, I’ll take your word for it. 🙂 This looks delicious and a great choice for SRC. I LOVE this! It’s perfect for a weekday evening as it can be on the table in less than 45 minutes. Thanks for sharing. Yep, it is pretty quick to whip up! I love one dish meals like this and this one sounds like it’s loaded with flavor and great ingredients! Thanks, Chris. I usually don’t like a lot of cooked peppers but this was pretty tasty! That looks delicious. All those lovely peppers!!! I really liked the pepper combo in this. In fact, I am thinking about some chicken Italian sausage for the next time I make it. Oh, that would be a nice sub! This is The Pasta for me! I love all the flavors in it and it is a meal that would please my whole family! I think it is a family pleaser. Cute list by Annie. Don’t worry Annie – I talk to my car as well. I’m sure you have a name for it as well. 🙂 Great looking dish! 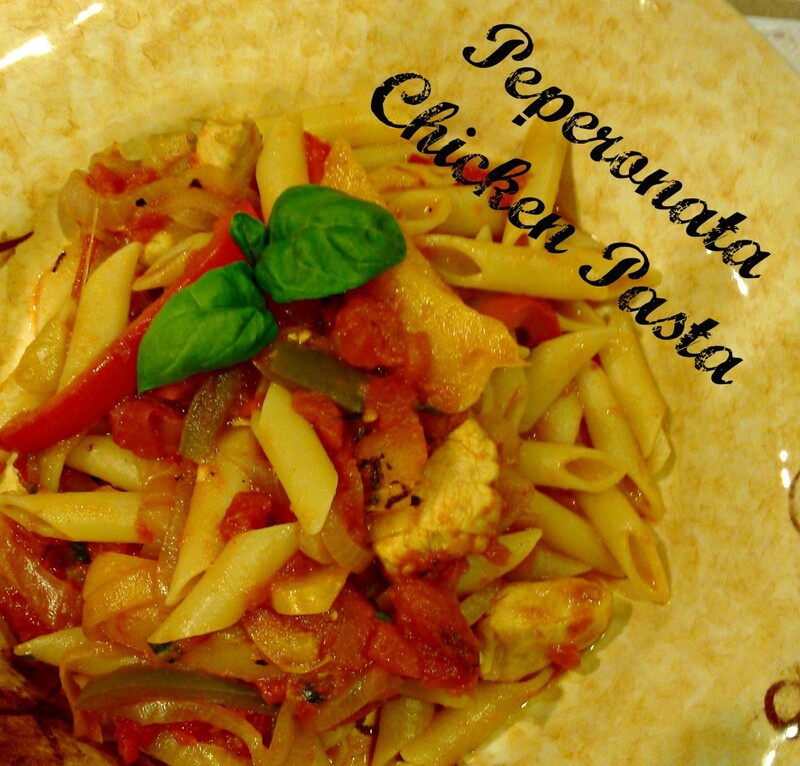 I love peperonata but haven’t every made it with chicken. I had never made it so it was a great dish to try for SRC. This sounds like a great pasta dinner! A one pot meal is perfect for this time of year. It looks delicious as well as all the other dishes in your post! It is a good one pot meal.